Welcome to the Sealtopia Forums Guest! Please read the rules before posting! Thanks! The Annoucements of the forum. Got a question or suggestion? Post here! Finished Sprites/Artwork will be posted here. Talk about anything related to Sealtopia here. Post your Ideas for Sealtopia here! You can Ask/Request graphics and such to be made here. Post questions for Sealtopia here! There will be a magizine in-game in Sealtopia. Post suff about it here. The Game updates will be posted here. Talk about the media here. Say hi if your new! Play fun posting games here. 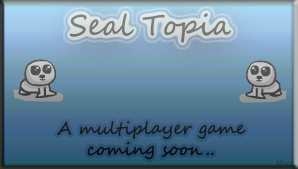 All of the old Seal Topia threads go.